The Fourth Great Ninja War intensifies as the Allied Forces face the might of the Reanimated Jinchuriki, who have been equipped with both the Rinnegan and Sharingan. 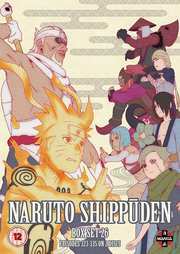 Naruto tries to convince the Four Tails that he’ll free him and the other Tailed Beasts from Madara’s control. While listening to Naruto, the Nine Tails goes through a surprising change. Meanwhile, Sasuke has obtained new information found at one of Orochimaru’s old hideouts that may turn the tide of the entire war! Will the unity of the Allied Forces hold under combined fury of the Reanimated Jinchuriki and their mysterious commander?